A new positive energy is rising from the Palyul lineage since our root Guru Kyabje Penor Rinpoche has come back for us as the young, and very energetic, unmistakeable incarnation of His Holiness Penor Rinpoche who passed away in 2009. This Autumn we are pleased to announce a new course at the Palyul Centre UK from 3 November 2017 to May 2018 based on Khenchen Namdrol Rinpoche‘s teachings on The Words of my Perfect Teacher by Patrul Rinpoche; by first listening to his words on CD and then expanding on them, we will cover part one (the ordinary or external preliminaries) during the course. 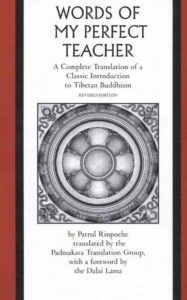 We would like to invite you to attend this unique opportunity to gain an insight into these precious teachings, and to enable you to take part fully, we recommend you buy a copy of The Words of My Perfect Teacher by Patrul Rinpoche) in English translated by Padmakara Translation Group. The course will take place on Friday evenings from 7pm – 9pm and we suggest a donation of ?7 per evening. If you are interested, please contact us. I am Chonyi Wodser, and will be presenting the course. I am a former monk of Namdorling and was so fortunate to able to serve my root Guru, the late His Holiness Penor Rinpoche since the tender age of 13. I spent whole my monkhood with him as one of his personal assistants, and I look forward to meeting you and sharing these precious insights.